24 x 29 cm  p. : chiefly col. ill.
"Father Christmas needs a wee. He's been drinking drinks since half past three . . ."At each different house that he visits Father Christmas drinks and eats all the goodies left out for him. Before long he really, really, really needs a wee. So much so that he even forgets to leave the presents behind. But he dashes back, delivers all the pressies and flies home at high speed to avoid an embarassing accident . . . there's just one tiny problem . 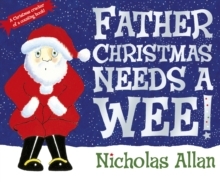 . . he's lost his house key!Find out what happens and whether Father Christmas ever gets to relieve himself in this brilliant and fabulously funny counting book from the talented author/illustrator Nicholas Allan!